Speciesism: The Movie director Mark Devries released a new video short that is so shocking and disgusting it must be seen to be believed. 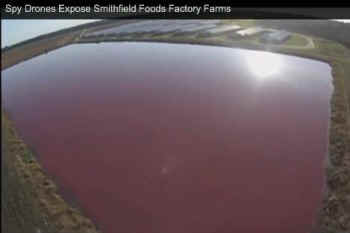 Devries flies a camera attached to a drone over a Smithfield pig factory farm in North Carolina. What it reveals are feces- and urine-filled lagoons that measure the length of four football fields. It’s truly sickening. 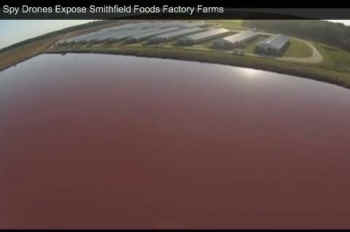 Devries tells us there are about 2,000 of these pig facilities in North Carolina alone. In an interview with Steve Wing, an associate professor of epidemiology at the Gillings School for Public Heath, Devries learns that these enormous toxic waste pools are emptied with the use of huge misters that turn the feces and urine into droplets that are sprayed into the air. Wing reveals that the misted waste can travel for miles and lead to serious health problems, including asthma, upper-respiratory ailments, and even elevated blood pressure, for people and children living in communities nearby. Environmental and health issues are only part of the problem. Inside the factory farms that Devries documents live thousands of pigs who never see sunlight and suffer horrific abuses, such as castration, tail docking, and teeth clipping, which are all performed without painkillers. Mother pigs are forced to live nearly their entire lives in gestation crates, metal cages so small the animals can’t even turn around or lie down comfortably. By choosing a delicious and humane vegan diet, we can help put an end to factory farming. Visit ChooseVeg.com today and learn more.